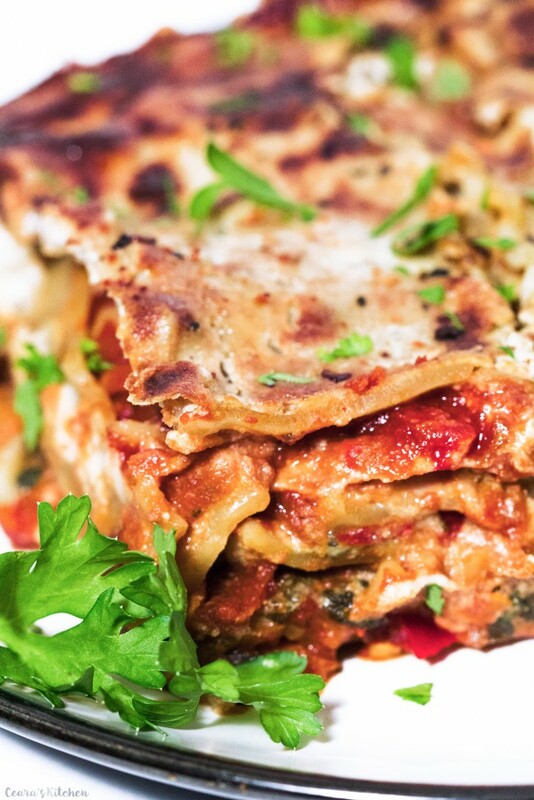 Hearty, cheesy, meaty and comforting Vegan Lasagna. This lasagna is perfectly layered with a thick and meaty tomato sauce and a cheesy, ricotta-style cheese sauce. One of my favorite recipes to make on the weekend. Sauté onions and garlic with a dash of olive oil or water over medium high heat for a couple of minutes until the onions are translucent. Add chopped mushrooms, peppers and optional zucchini/eggplant. Sauté for 2-3 minutes until soft and lightly cooked. Stir in spices (basil, oregano and hot pepper flakes) and sauté for a minute until fragrant. Add tomato sauce and balsamic vinegar to the vegetable mixture. Bring sauce to a boil and leave to simmer on a low heat for 30 minutes to 2 hours (stirring occasionally). Prepare the cheese sauce while the sauce is cooking. Defrost frozen spinach in the microwave. Squeeze out any excess liquid and measure out ¾ cup of spinach. Mix ½ of the cheese sauce with the spinach. If your lasagna noodles are not precooked, bring a pot of salted water to a boil and cook for 8 minutes until the lasagna sheets are cooked al-dente. Spread the cooked sheets out on parchment until you layer them in the lasagna. Note: you can skip this step if your lasagna noodles are already precooked. Preheat oven to 375F/190C and grease a casserole dish with olive oil or line with parchment paper. To assemble the lasagna, spread 1 heaping cup of tomato sauce on the first layer of a 9×13 casserole dish. Place 3-4 lasagna sheets on the tomato sauce. Top with 1 cup of the spinach cheese mixture, 1 cup of tomato sauce and 3-4 lasagna noodles. Repeat layers, alternating between the cheese and spinach-cheese sauce, until you have filled the pan. Spread an even layer of cheese sauce on top of the lasagna (see photo for reference). Sprinkle red pepper flakes on top (optional). Cover with foil and bake for 25 minutes, remove the foil and bake for an additional 20 minutes until the top of the lasagna is golden brown. Take the lasagna out of the oven and leave to sit for 15 minutes before slicing and serving. Enjoy! 1) Use gluten free lasagna noodles if you need this recipe to be gluten free.